British Columbia’s Sunshine Coast is often mistaken for an island region, which is understandable, considering the 180-kilometre stretch of coastline is only accessible by air or ferry service, and is scored with numerous inlets that create island-like land formations. However, the Sunshine Coast is in fact the mainland coastal area northwest of Vancouver. The region is bisected into northern and southern lobes by Jervis Inlet. 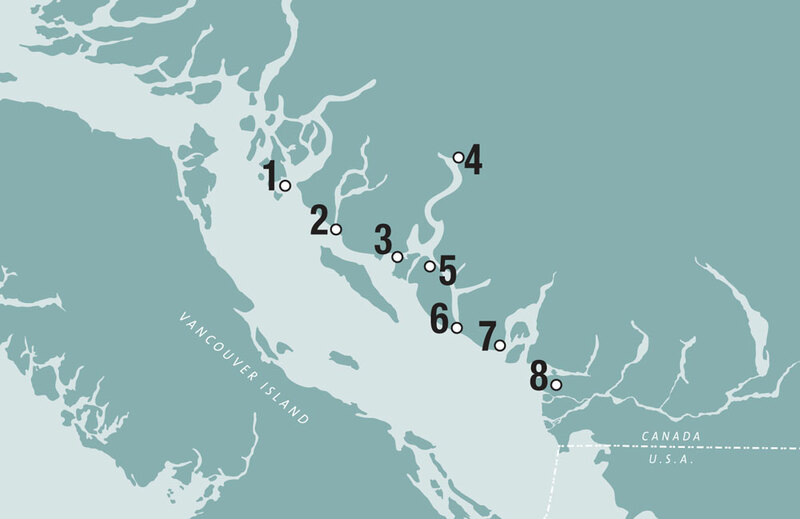 The primary population hubs on the southern Sunshine Coast are Gibsons and Sechelt, while Powell River is the largest centre on the northern coast. 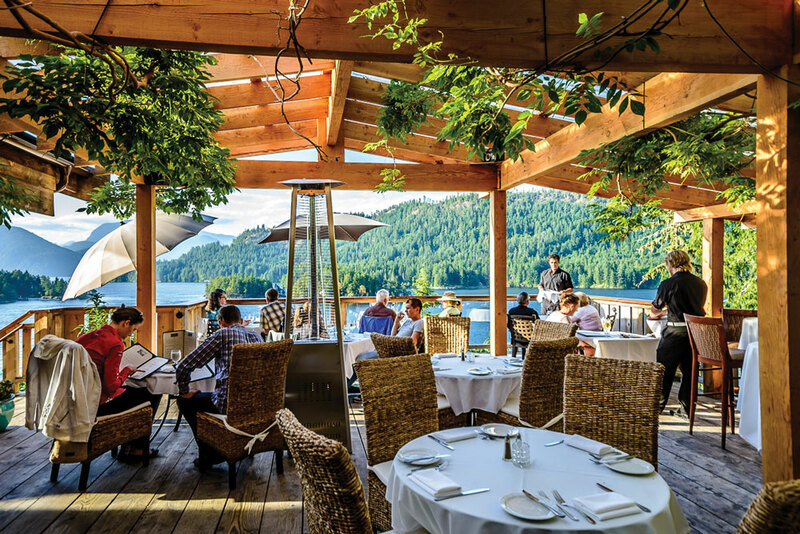 With its laid-back, unpretentious vibe, the Sunshine Coast beckons to land-locked Albertans hungry for ocean views, peaceful rainforests and marine adventure, all set against the awe-inspiring backdrop of B.C.’s Coast Mountain range. Sea kayaking is wildly popular on the Sunshine Coast – pretty much anywhere there’s easy access to calm waters, you’re bound to see pods of kayakers skimming along, taking in the local wildlife. 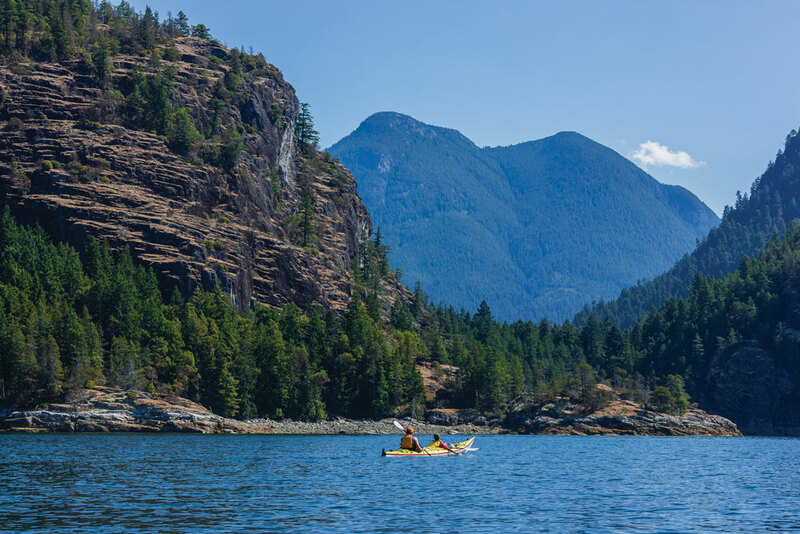 Powell River Sea Kayak offers a variety of day and overnight trips into Desolation Sound, a sprawling marine park on the northern coast dotted with forested islands to explore. Nervous novice paddlers can team up in a double kayak with a more experienced partner to help pilot the craft if the going gets rough. The Sunshine Coast has a growing craft-brewing scene that beer-lovers can tap into via the B.C. 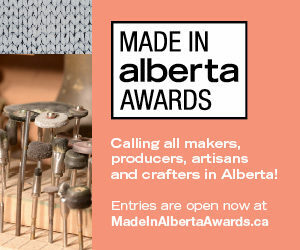 Ale Trail, an online guide to craft breweries in the province organized by region. Located on an 11-acre spread just up from the Langdale ferry port on the southern coast, you’ll find the Persephone Brewing Co. The self-described “beer farm” grows its own hops and runs a tasting room that feels like a family cabin with communal tables featuring chess boards and crokinole. 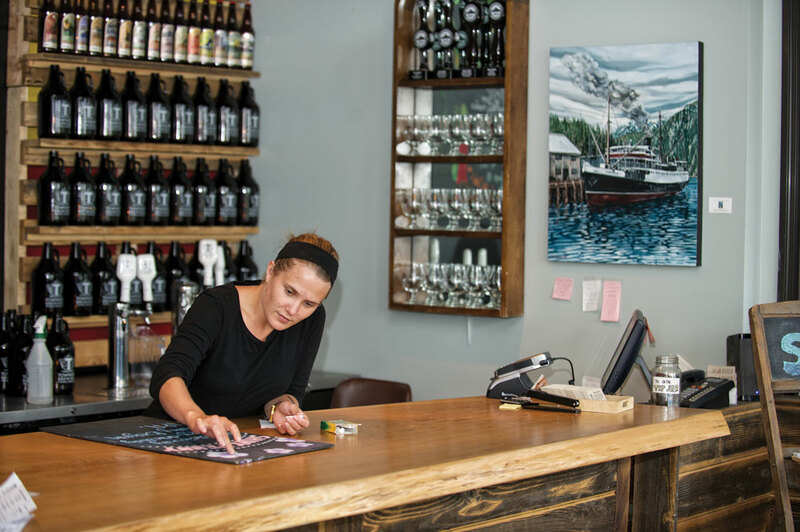 On the northern coast, you’ll find Townsite Brewing in the old post office building in the historic Townsite District of Powell River. Helmed by an experienced Belgian brewmaster, the brewery incorporates local flavour into the names of its beers, which you can sample in the small tasting room adorned with a growler collection that extends over an entire wall. 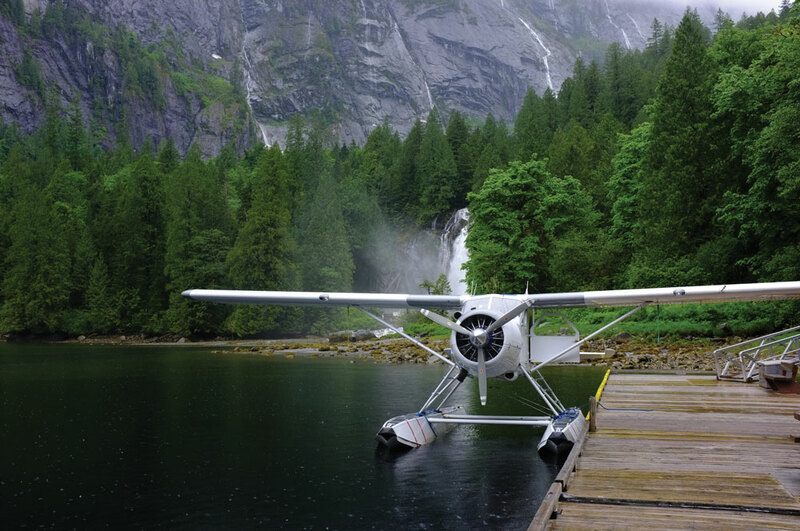 Picturesque Princess Louisa Inlet is popular with the yachting set, but if you don’t have a luxury watercraft to access this glacier-cut fjord surrounded by rainforest-covered mountains, the next best way is via floatplane. Sechelt-based Sunshine Coast Air runs private flightseeing charters in a six-seat Dehavilland Beaver. The plane drops you at the gateway to Princess Louisa Marine Provincial Park, a protected area that encompasses the 120-foot Chatterbox Falls. The falls can be reached by a short, easy walk on boardwalk paths. The park is equipped with a large communal picnic shelter complete with fire-pit, though if the sun is shining, you’ll want to be on the beach. The Skookumchuck Narrows are famous for a naturally occurring daily phenomenon in which the tides turn a strip of placid coastline into roiling rapids. Reach the narrows by hiking the trail through the old-growth rainforest of Skookumchuck Narrows Provincial Park, southeast of the small town of Egmont on the southern coast. Local-history buffs will want to check out the Egmont Heritage Centre across from the trailhead, which contains a collection of antique boating engines, old fishing and logging tools, Depression glass and other curios. If you’re a hiker, chances are you’ve heard of the West Coast Trail on Vancouver Island, a multi-day trek requiring advance reservations and trail fees. The Sunshine Coast Trail, a 180-kilometre hut-to-hut trek (the longest in Canada) on the northern coast, is an under-the-radar alternative that’s free to use with no reservation required. Created and maintained by the Powell River Parks and Wilderness Society (a.k.a. “PAWS”), a grassroots group formed in the 1990s, the trail sets out from a point just steps from the Saltery Bay ferry terminal and meanders northward from there to Desolation Sound. You don’t have to do the trail in its entirety – choose your own adventure as far as days and distance, making use of a range of amenities that includes huts, campsites, picnic tables, composting outhouses and swimming wharfs. Don’t be surprised if you meet PAWS co-founder Eagle Walz out there. He remains one of the trail’s most ardent champions and dedicated volunteers. 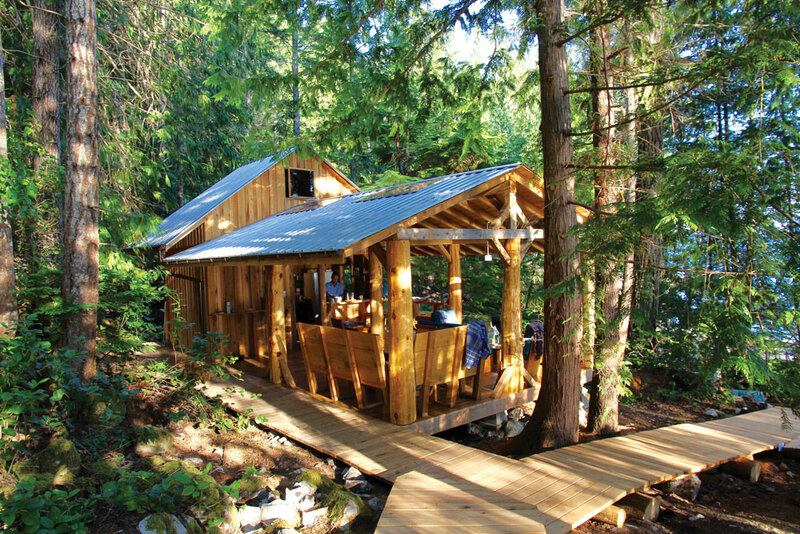 Run by the owners of Powell River Sea Kayak, this exclusive resort on otherwise uninhabited Kinghorn Island in Desolation Sound consists of four guest cabins and a cabana-style hub where meals are served family-style. Accessed only by boat (guests can opt to send their bags with the boat and kayak themselves in) Cabana is the ultimate unplugged experience, though the rustic setting doesn’t mean you’re roughing it. The morning wake-up call comes with a French press of freshly ground coffee on a finished round of wood, and the gourmet meals are a far cry from camp cuisine. Days are filled with kayak excursions, stand-up paddle boarding and relaxing in ocean-side hammocks. If conditions permit, Cabana staff will gather fresh oysters to barbecue over an open fire on the beach. Keep your ears pricked for the splash of breaching whales. West Coast Wilderness Lodge patio. This handsomely appointed lodge on a remote tip of the southern coast is built on a rock bluff overlooking the ocean. Guest cabins envelop the central timber-framed building where you’ll find Inlets Restaurant, a breakfast, lunch and fine-dining operation with a wall of windows that provide unfettered views. You can also enjoy the scenery from lounge chairs on the expansive deck and from the open-air patio, an intimate space with a greenery-adorned pergola and outdoor fireplace. The lodge will also arrange various day excursions, including kayaking, hiking and zodiac trips to Princess Louisa Inlet. Former Vancouverite husband-and-wife restaur-ateur team Michael and Sarah Salome are behind this excellent eatery in the heart of Powell River, a modern-rustic room endowed with a stellar view of the Malaspina Strait. The menu here is elevated comfort food. A starter of Brussels sprouts comes roasted and tossed with lemon, pecans, capers and Parmesan cheese, while the indulgent chicken-and-waffles is served sandwich-style (the waffles substituting for bread) with pickled slaw and house-made hot sauce. Pair your meal with something fresh from the inventive cocktail list such as the Ferrytale Elix Spritz, a mix of locally brewed kombucha, green tea, rose petals and a sparkling-wine finish. From all appearances, this homey room tucked in a garden grove is the quintessential Sunshine Coast restaurant, but it’s the food that makes The Gumboot exemplary. With a menu focused around whole foods and locally grown produce, the Gumboot serves up luscious breakfasts until 2:30 p.m., substantial salads with house-made dressings, a range of run-down-your-fingers-juicy burgers (including a superb lentil-and-beet veggie option) and a dinner menu with entrees priced under $30.